Mayor Steve Hagerty speaks at a meeting. Council members approved Evanston’s 2018 operating budget at a Monday City Council meeting. Aldermen unanimously approved Evanston’s 2018 operating budget at a Monday City Council meeting, granting the city over $335 million for the next fiscal year. The budget’s approval comes after months of deliberation among aldermen. It is set to combat a deficit totaling almost $6 million which will be filled through a combination of tax increases and restructuring in certain departments. Initial budget proposals had called for reductions and reassignments of staff between departments. Aldermen and city officials spent the past few months discussing and reworking the details of the proposed budget before approving it Monday. In addition to approving the budget, aldermen also had to approve possible cuts to the Evanston Public Library’s operating budget and the city clerk’s budget. Residents expressed concerns about both measures at the meeting. Aldermen ended up approving a tax levy for the library, which allows it to continue operations under its 2018 budget. The tax levy will be raised about 5 percent from the year previous, city documents show, subsequently increasing the property taxes through which it is funded. Ald. Cicely Fleming (9th) said she was concerned by the increase in the tax levy, especially considering the overall budget deficit. Fleming said she would feel more comfortable with more cuts to the budget and more conservative financial decisions. EPL Director Karen Danczak Lyons said she had met with the library board to discuss and approve further cuts — which include eliminating funding for a mobile book van. In addition to its main budget, the library is planning renovations to its main branch, beginning in 2018, and will receive funding through general obligation bonds. Though aldermen approved the library tax levy and operating budget at Monday’s meeting, Mayor Steve Hagerty said council members will meet again in January to discuss specifics concerning the library renovations and budget proposal. Council members also discussed City Clerk Devon Reid’s request for additional funding to be allocated to his office in order to help expand its services. He said that in addition to its regular duties, the clerk’s office is looking to digitize more city records as well as make the weekly city council minutes more user-friendly and translate them into Spanish. Additionally, Reid said the clerk’s office wants to reach out to residents and encourage them to register to vote and participate in the upcoming elections. He added that the clerk’s office is looking into options for mobile voter registration and pop-up voting at Evanston Township High School. Ald. Donald Wilson (4th) said he was hesitant to approve increases to the clerk’s budget because he felt the proposals were still too vague. He pointed to Reid’s request for software to aid in the creation of the weekly minutes, which did not list specific software types or price points, Wilson said. Aldermen ultimately approved an $8,000 increase to the 2018 budget which will be allocated to Reid’s office. The motion was tied among aldermen — Ald. 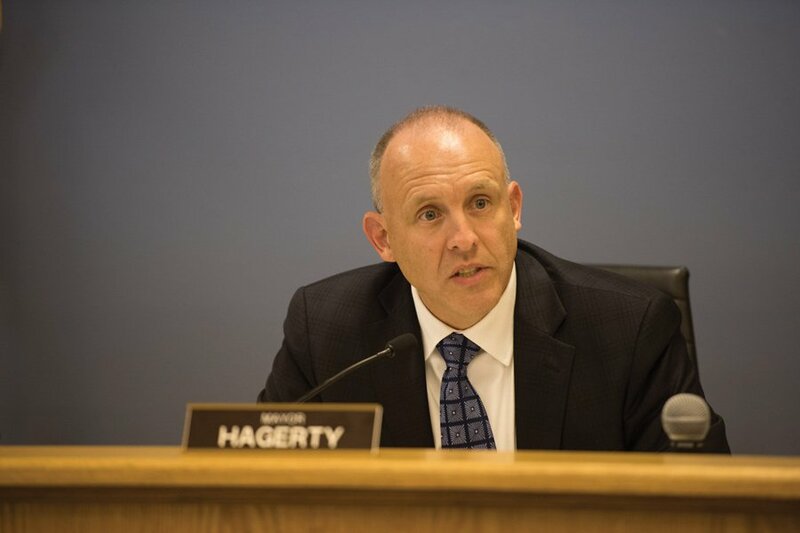 Melissa Wynne (3rd) was absent from the meeting — but Hagerty cast the final vote in favor of the increase. Monday marked the last City Council meeting for 2017, with council members scheduled to meet again Jan. 8, after the implementation of the new budget. Clarification: This article was updated to clarify the nature of the budget deficit.